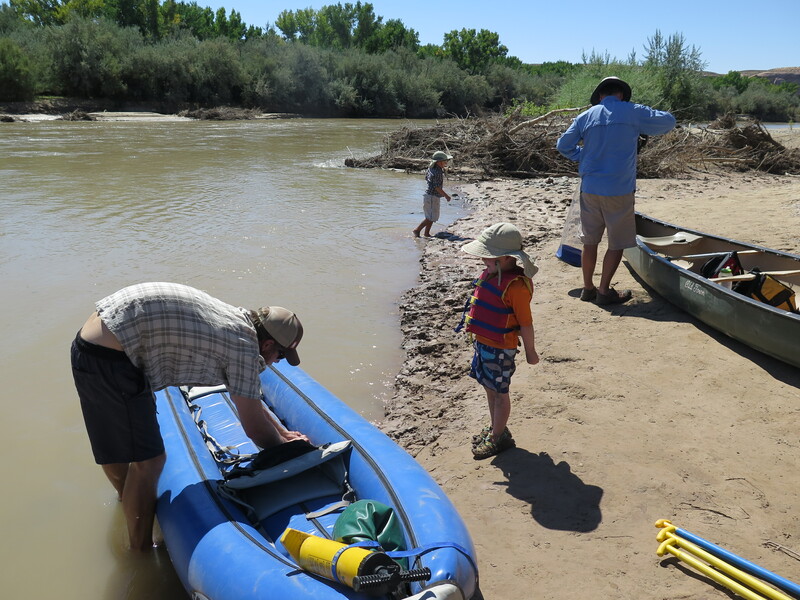 It’s been five long, dry years, but I’m ecstatic to report that a few weeks ago my family floated the San Juan River for the first time since before my son was born! My son is now four years old, and all summer my husband and I were talking about wanting to do a day trip on the San Juan with him, but for one reason or another, it just never happened. This summer flew by like no other, and I’m still a little bit in shock that we’re already a week into October! Scared or excited… I can’t tell! One San Juan County event that we never miss is the Utah Navajo Fair Parade in Bluff in mid-September. It’s an awesome parade with lots of decorated floats, music, and TONS of candy and other goodies for the kids. The first year we went, my son ended up with several pieces of fruit, a pin wheel, some books, and quite a few other small toys. Every year when we head down to Bluff for the fair, we always try to plan something else to do in the area to make a day out of it, and this year since the weather was nice we decided to float from the old swinging bridge to Sand Island. I guess I should mention since it might be a little confusing to those not very familiar with the area. We call the put-in, ‘Swinging Bridge’, which would normally indicate that there was a suspension bridge there, but there isn’t actually a bridge there anymore. It was damaged in a series of floods about 10 years ago, and unfortunately was never repaired, and eventually taken down. The ‘Swinging Bridge’ put-in is located on Hwy. 163 about 3-4 miles east of Bluff. I’ll admit, it took a little convincing for my husband to get me to agree to do that section of river. The last time we floated the Swinging Bridge to Sand Island was the summer we moved here, so it’s been over 7 years, and for some reason I thought I remembered not being very impressed with that stretch of the river. I feel like I remember that there was an overturned car in the river, and some type of appliance- a fridge, washer… something like that. But anyway, my husband finally talked me into it, and I’m really glad he did. It was nothing like I remembered and it was absolutely beautiful! We recruited some friends who live in Bluff to go with us, so we all took our stuff to the put-in, then our friend and I shuttled a vehicle to Sand Island while my husband inflated our kayak and watched the kids. When we returned from the shuttle the kids had come up with a ‘zero gravity’ game as they called it, which involved holding on to a branch of a tree that had washed up on shore and bouncing like crazy! We only caught the tail end of it when we got back- I think they were kind of over it by that point. But I was glad they had found a way to get their energy out before it was time to sit in the boats for a few hours! Right away I knew I was wrong about that stretch of river- it was beautiful! When we started out the canyon was pretty wide and you couldn’t really see the walls, but soon the canyon wall on the left side closed in and we had beautiful views of the red-rock walls the rest of the day. My son was beyond excited to be on the river! 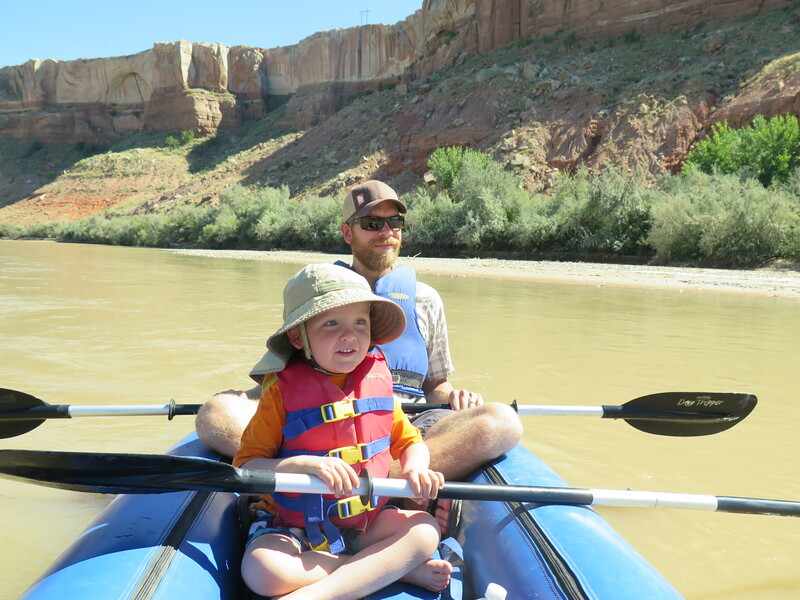 Just recently we went on a jet boat on the Colorado with some friends, and that’s probably the smallest boat my son had ever been on at that time. At times he could reach his hand out over the side of the boat and touch the spray, but practically sitting on the water in a small inflatable kayak is a whole different experience. He loved that he could help paddle and that he could reach his hands and feet over the side and dip them in the water. He loved getting to help paddle. I know that most of the time he was probably blocking my husband from paddling more than he was actually ‘helping‘, but he was having fun and that’s what’s important! Rather than trying to teach our son any kind of technical skills or techniques when we’re doing things outdoors (I mean, he’s only 4 for crying out loud!) we’re just trying to instill a love of being outside, and a curiosity for the world around him. I think as long as he’s having fun on our ‘adventures’, hopefully he’ll just naturally grow up loving to be outside. I hope it works- it’s looking good so far! Happy that mom is finally telling him to go play in the mud! Teaching my son the joys of playing in the mud! ‘Decorating’ himself with mud on the San Juan River! After the mud hole stop, we pretty much just floated until we got to Sand Island. One thing that was really cool was when we were floating past the town of Bluff, since the Utah Navajo Fair was going on, we could hear music from the Pow Wow faintly in the distance. This trip was the perfect length for young kids- only about 7 miles. I’m sure my son could have gone much farther if we’d taken more breaks and let him run around more, but just about a half mile or so from Sand Island, he started asking if we were almost done. Luckily (for all of us) the answer was yes! This short half-day trip has given me great hope that we will be able to do a multi-day/multi-night trip next summer. 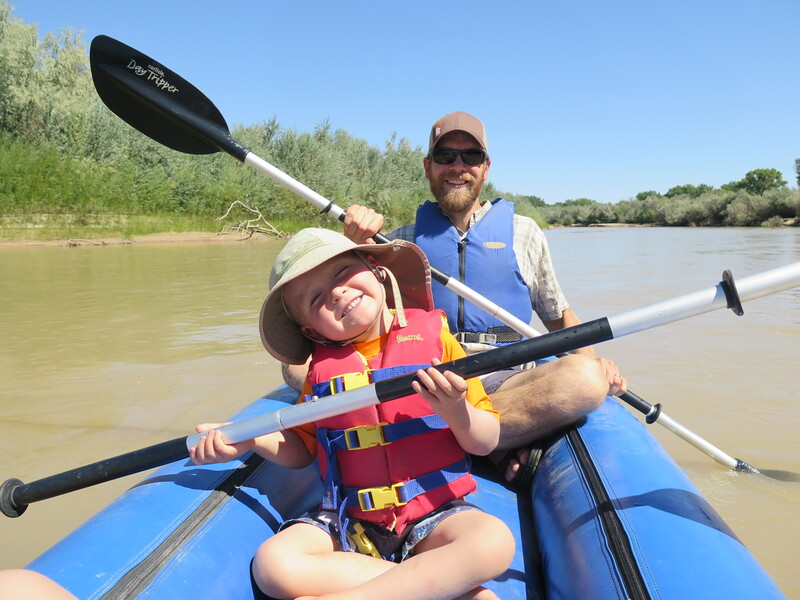 My husband grew up taking yearly trips on the San Juan River with his family and their friends, and I’d love to be able to do the same with our son, so stay tuned! I hope to be able to share a blog entry on an overnight trip in summer 2017! This entry was posted in Bluff, Off the Beaten Path, San Juan River, Things to do for FREE!, Things to do with kids, Travel, Utah and tagged Bluff, Off the Beaten Path, Parades, Rafting, San Juan River, Things to do for FREE!, Things to do with kids, Travel, Utah. Bookmark the permalink. It was so much fun- it was really nice to be back on the river after so long. Looking forward to an overnight trip next year! Have you been on the San Juan River yet?